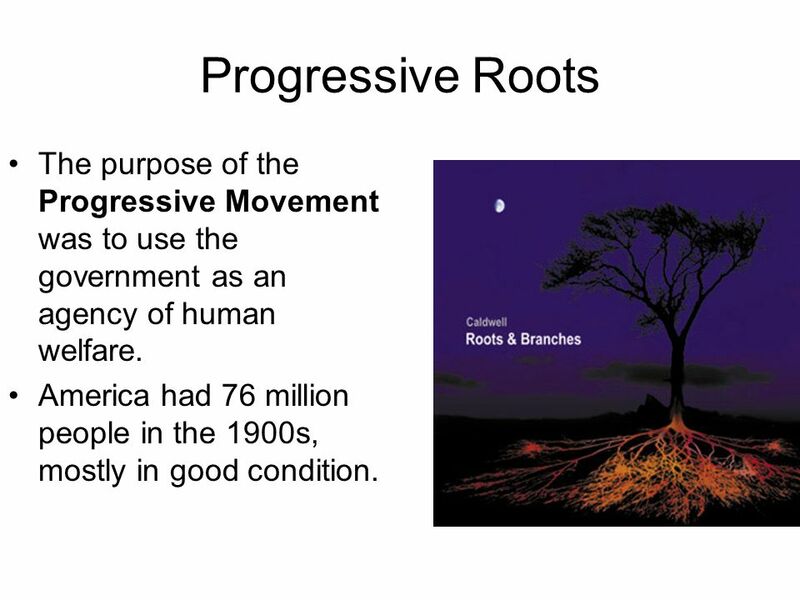 Progressive Roots The purpose of the Progressive Movement was to use the government as an agency of human welfare. America had 76 million people in the. 2 Progressive Roots The purpose of the Progressive Movement was to use the government as an agency of human welfare. America had 76 million people in the 1900s, mostly in good condition. 3 Progressive Roots The Progressives had their roots in the Greenback Labor Party of the 1870s and 1880s and the Populist Party of the 1890s. In 1894, Henry Demarest Lloyd exposed the corruption of the monopoly of the Standard Oil Company with his book Wealth Against Commonwealth, while Thorstein Veblen criticized the new rich (those who made money from the trusts) in The Theory of the Leisure Class (1899). 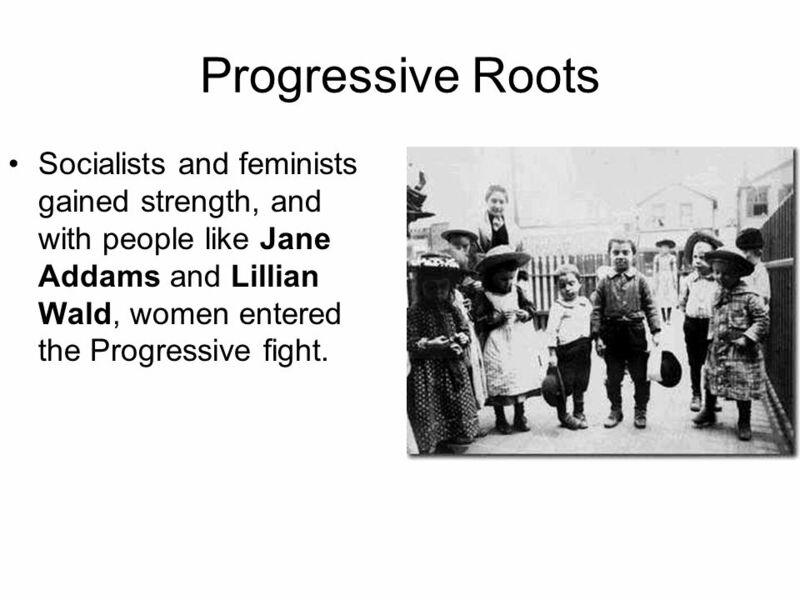 4 Progressive Roots Socialists and feminists gained strength, and with people like Jane Addams and Lillian Wald, women entered the Progressive fight. Beginning about 1902, a group of aggressive ten- and fifteen-cent popular magazines, such as Cosmopolitan, Collier’s, and Everybody’s, began flinging the dirt about the trusts. 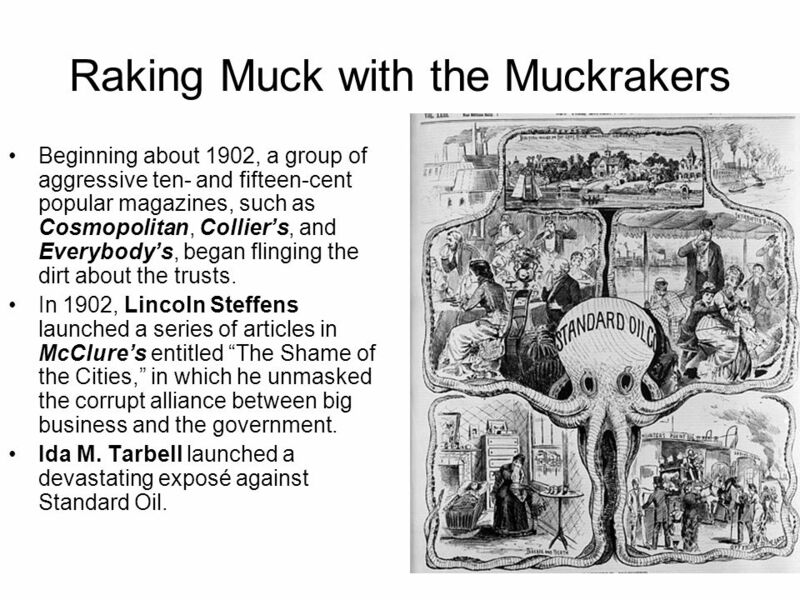 In 1902, Lincoln Steffens launched a series of articles in McClure’s entitled “The Shame of the Cities,” in which he unmasked the corrupt alliance between big business and the government. Ida M. Tarbell launched a devastating exposé against Standard Oil. David G. Phillips charged that 75 of the 90 U.S. Senators did not represent the people but actually the railroads and trusts. 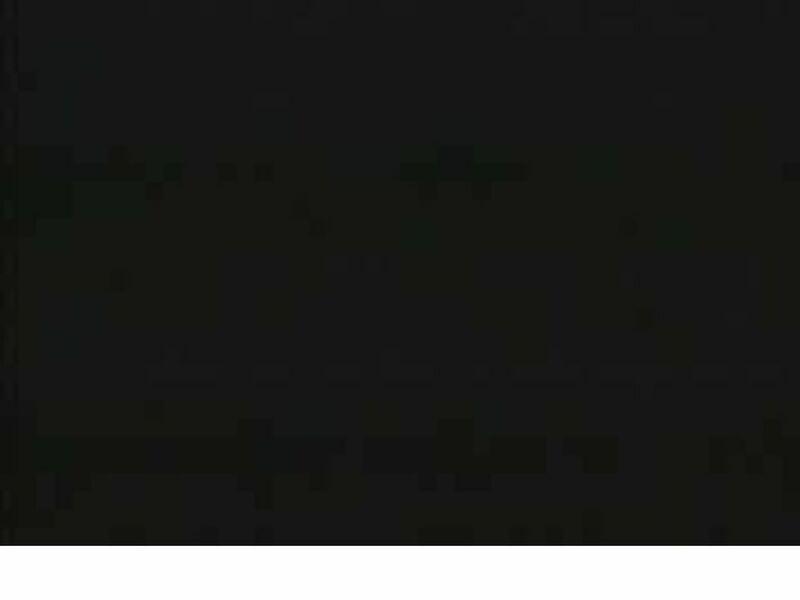 Ray Stannard Baker’s “Following the Color Line” was about the illiteracy of Blacks. 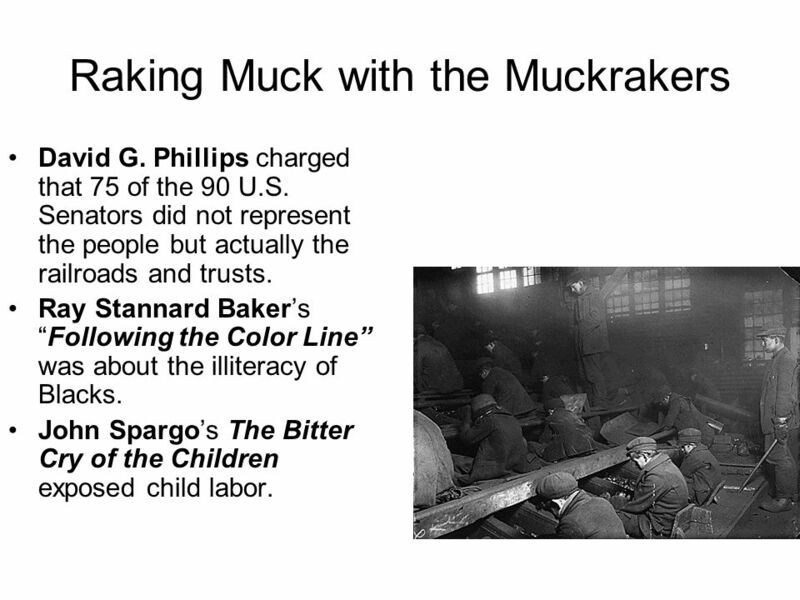 John Spargo’s The Bitter Cry of the Children exposed child labor. 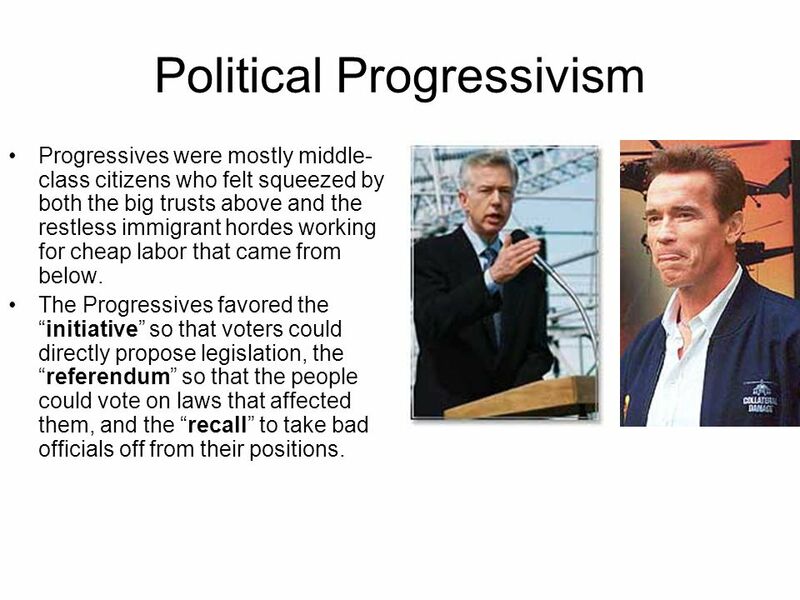 Progressives were mostly middle-class citizens who felt squeezed by both the big trusts above and the restless immigrant hordes working for cheap labor that came from below. The Progressives favored the “initiative” so that voters could directly propose legislation, the “referendum” so that the people could vote on laws that affected them, and the “recall” to take bad officials off from their positions. 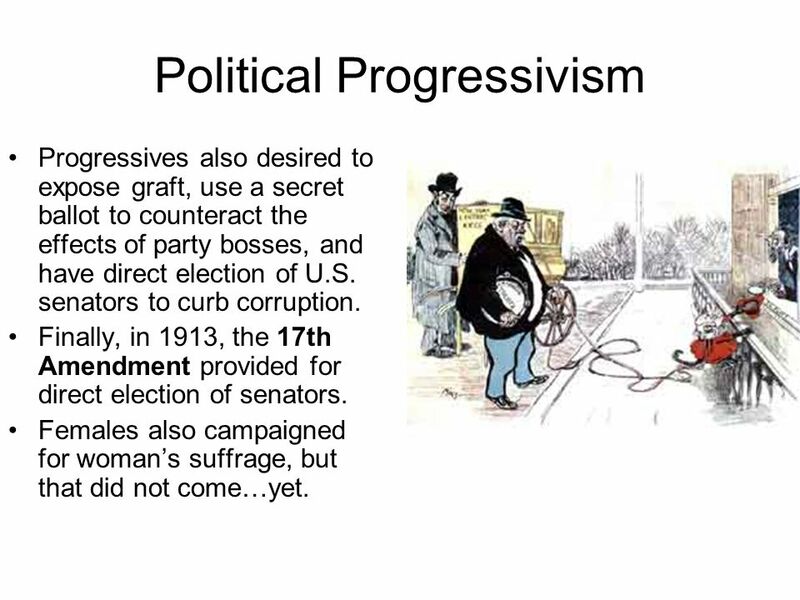 Progressives also desired to expose graft, use a secret ballot to counteract the effects of party bosses, and have direct election of U.S. senators to curb corruption. Finally, in 1913, the 17th Amendment provided for direct election of senators. Females also campaigned for woman’s suffrage, but that did not come…yet. 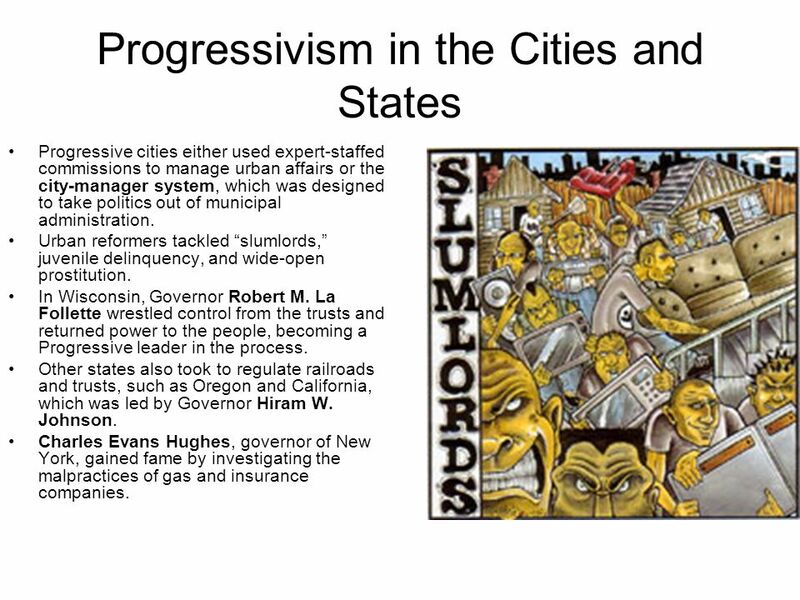 Progressive cities either used expert-staffed commissions to manage urban affairs or the city-manager system, which was designed to take politics out of municipal administration. Urban reformers tackled “slumlords,” juvenile delinquency, and wide-open prostitution. In Wisconsin, Governor Robert M. La Follette wrestled control from the trusts and returned power to the people, becoming a Progressive leader in the process. Other states also took to regulate railroads and trusts, such as Oregon and California, which was led by Governor Hiram W. Johnson. Charles Evans Hughes, governor of New York, gained fame by investigating the malpractices of gas and insurance companies. 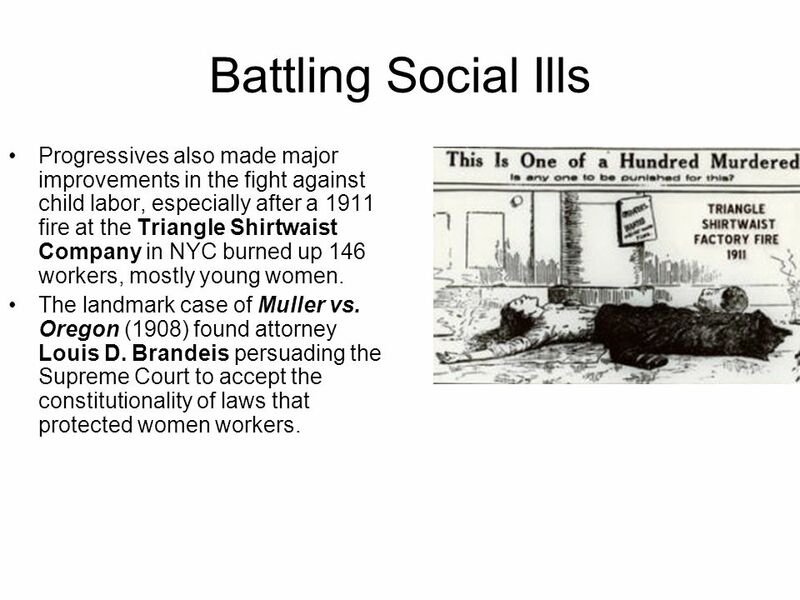 10 Battling Social Ills Progressives also made major improvements in the fight against child labor, especially after a 1911 fire at the Triangle Shirtwaist Company in NYC burned up 146 workers, mostly young women. The landmark case of Muller vs. Oregon (1908) found attorney Louis D. Brandeis persuading the Supreme Court to accept the constitutionality of laws that protected women workers. 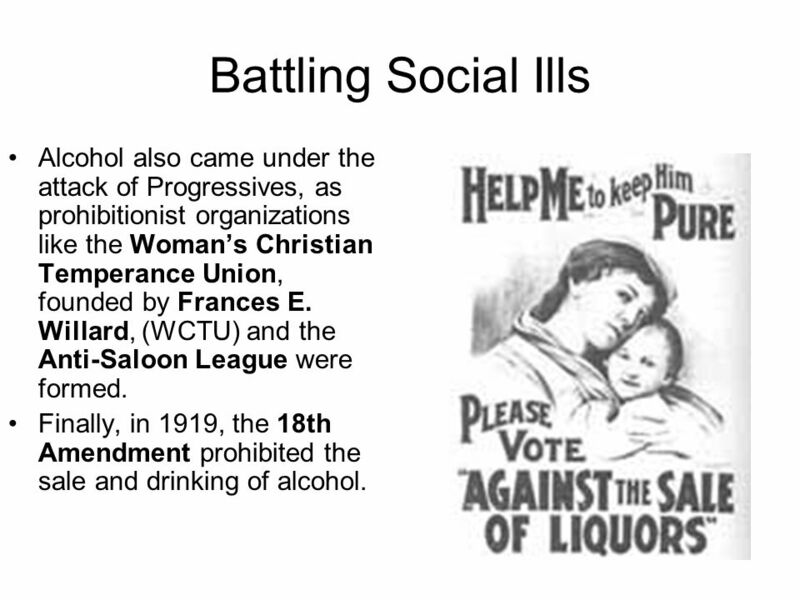 11 Battling Social Ills Alcohol also came under the attack of Progressives, as prohibitionist organizations like the Woman’s Christian Temperance Union, founded by Frances E. Willard, (WCTU) and the Anti-Saloon League were formed. Finally, in 1919, the 18th Amendment prohibited the sale and drinking of alcohol. 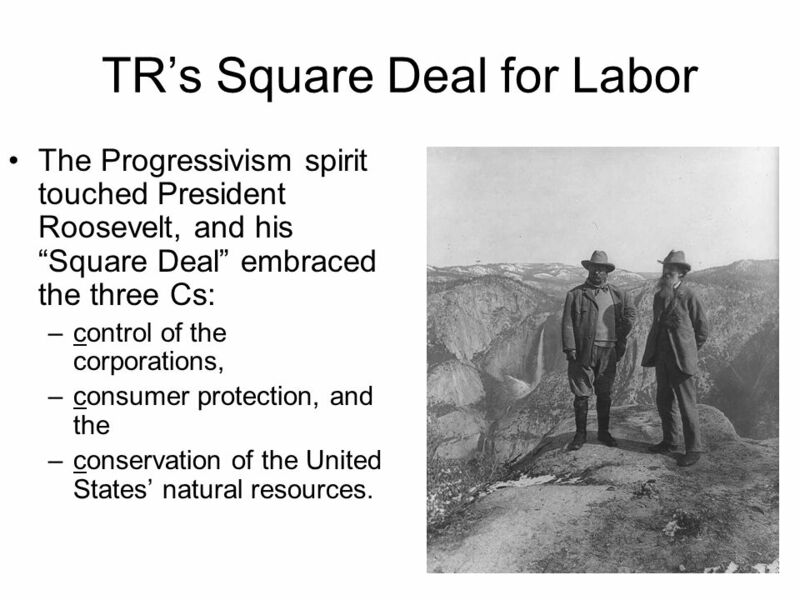 The Progressivism spirit touched President Roosevelt, and his “Square Deal” embraced the three Cs: control of the corporations, consumer protection, and the conservation of the United States’ natural resources. In 1902, a strike broke out in the anthracite coalmines of Pennsylvania, and some 140,000 workers demanded a 20% pay increase and the reduction of the workday to nine hours. 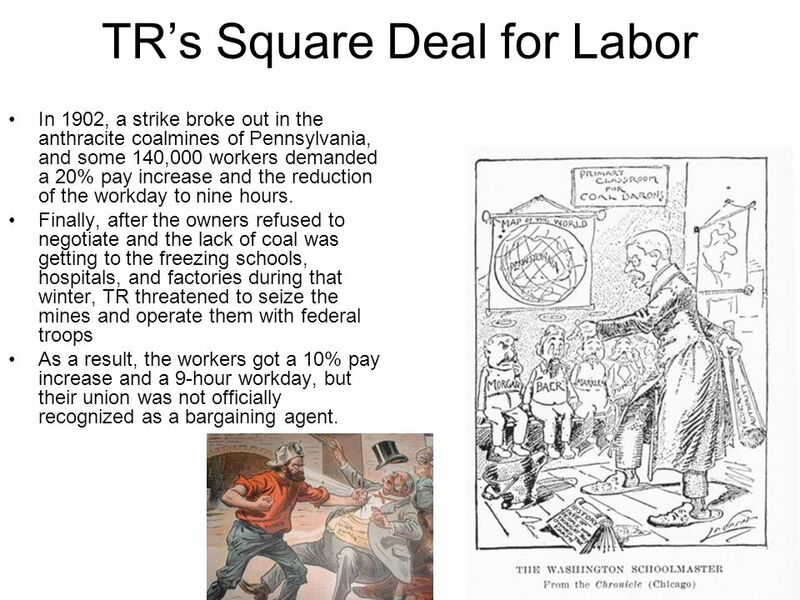 Finally, after the owners refused to negotiate and the lack of coal was getting to the freezing schools, hospitals, and factories during that winter, TR threatened to seize the mines and operate them with federal troops As a result, the workers got a 10% pay increase and a 9-hour workday, but their union was not officially recognized as a bargaining agent. 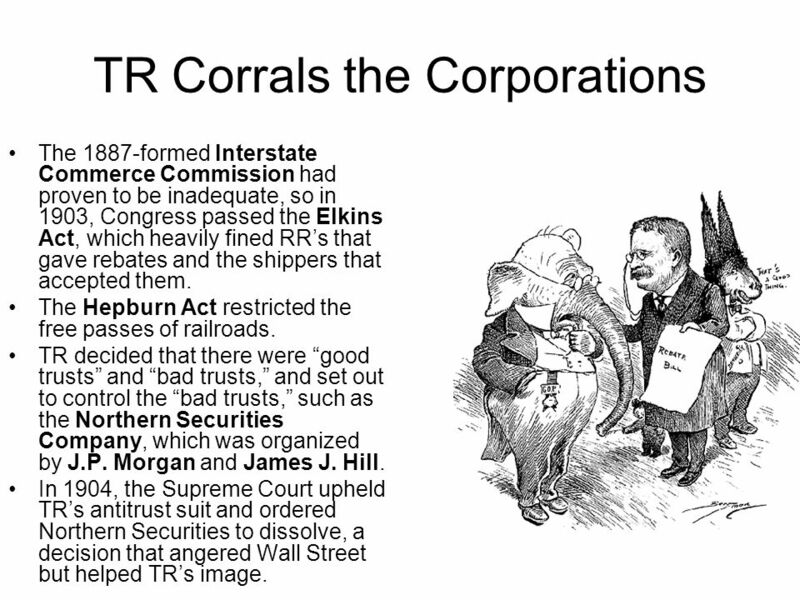 The 1887-formed Interstate Commerce Commission had proven to be inadequate, so in 1903, Congress passed the Elkins Act, which heavily fined RR’s that gave rebates and the shippers that accepted them. The Hepburn Act restricted the free passes of railroads. TR decided that there were “good trusts” and “bad trusts,” and set out to control the “bad trusts,” such as the Northern Securities Company, which was organized by J.P. Morgan and James J. Hill. 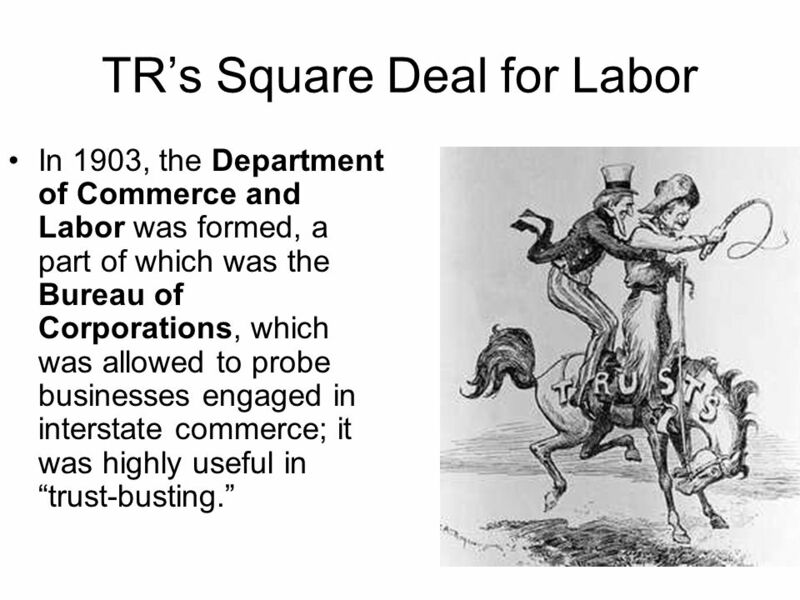 In 1904, the Supreme Court upheld TR’s antitrust suit and ordered Northern Securities to dissolve, a decision that angered Wall Street but helped TR’s image. 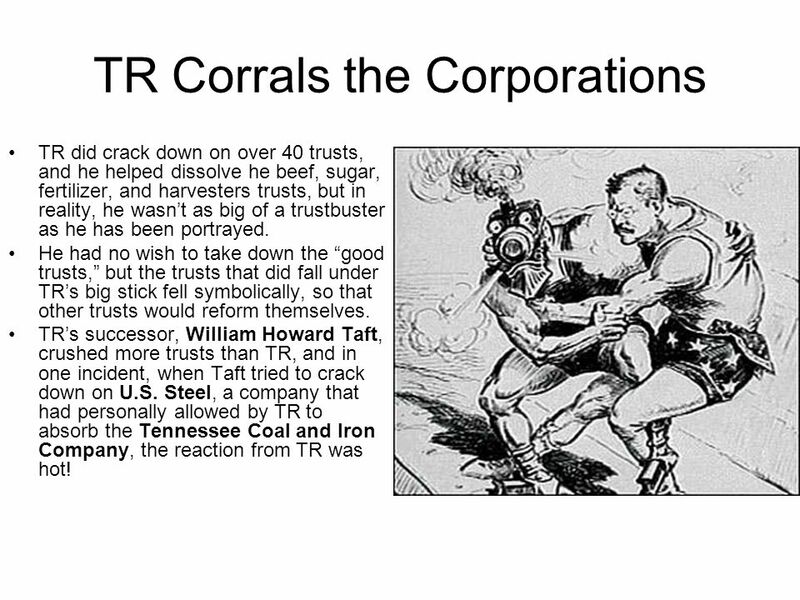 TR did crack down on over 40 trusts, and he helped dissolve he beef, sugar, fertilizer, and harvesters trusts, but in reality, he wasn’t as big of a trustbuster as he has been portrayed. He had no wish to take down the “good trusts,” but the trusts that did fall under TR’s big stick fell symbolically, so that other trusts would reform themselves. 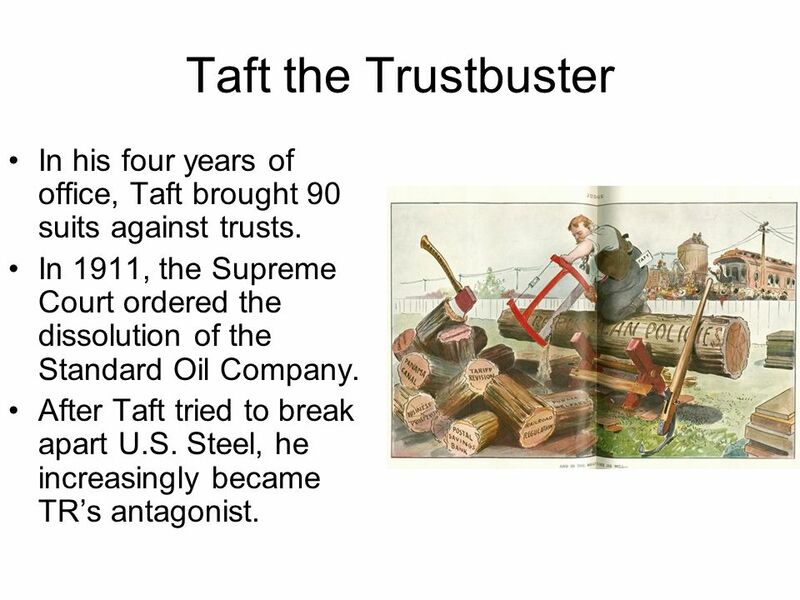 TR’s successor, William Howard Taft, crushed more trusts than TR, and in one incident, when Taft tried to crack down on U.S. Steel, a company that had personally allowed by TR to absorb the Tennessee Coal and Iron Company, the reaction from TR was hot! 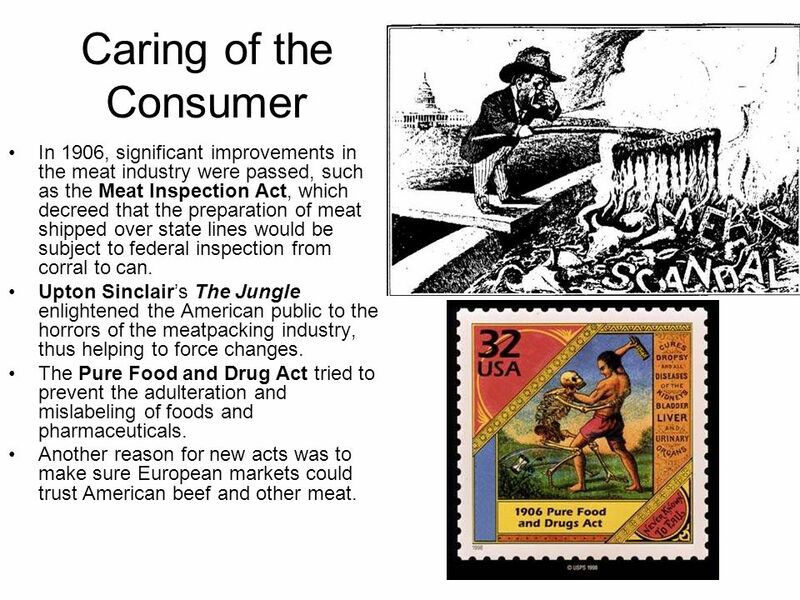 17 Caring of the Consumer In 1906, significant improvements in the meat industry were passed, such as the Meat Inspection Act, which decreed that the preparation of meat shipped over state lines would be subject to federal inspection from corral to can. Upton Sinclair’s The Jungle enlightened the American public to the horrors of the meatpacking industry, thus helping to force changes. The Pure Food and Drug Act tried to prevent the adulteration and mislabeling of foods and pharmaceuticals. Another reason for new acts was to make sure European markets could trust American beef and other meat. 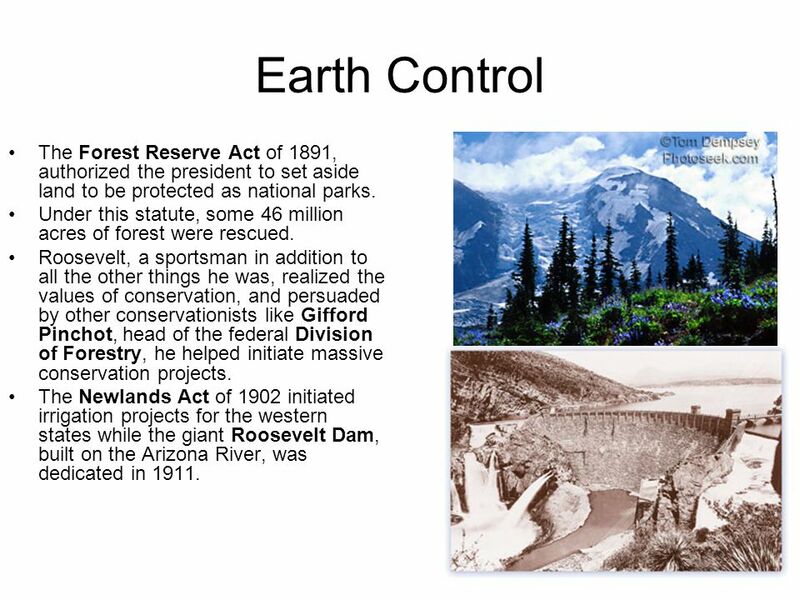 18 Earth Control The Forest Reserve Act of 1891, authorized the president to set aside land to be protected as national parks. Under this statute, some 46 million acres of forest were rescued. Roosevelt, a sportsman in addition to all the other things he was, realized the values of conservation, and persuaded by other conservationists like Gifford Pinchot, head of the federal Division of Forestry, he helped initiate massive conservation projects. The Newlands Act of 1902 initiated irrigation projects for the western states while the giant Roosevelt Dam, built on the Arizona River, was dedicated in 1911. 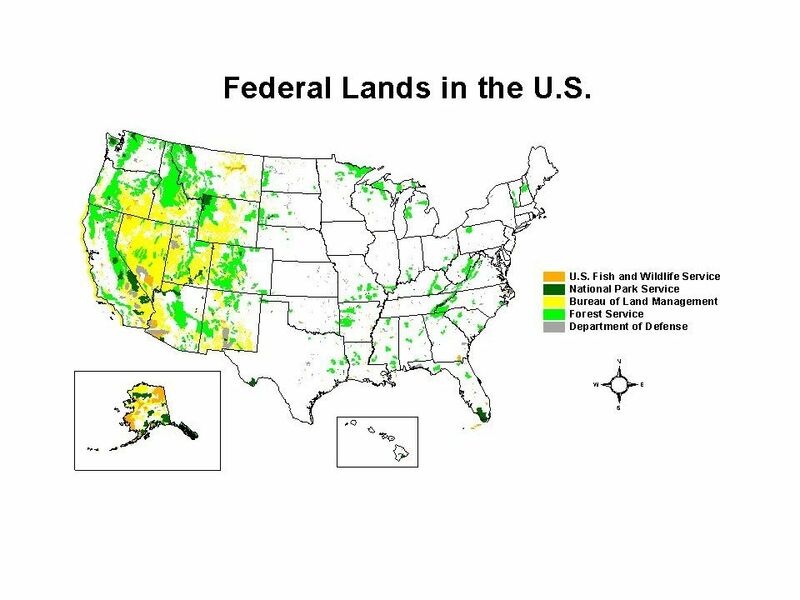 21 Earth Control By 1900, only a quarter of the nation’s natural timberlands remained, so he set aside 125 million acres, establishing perhaps his most enduring achievement as president. 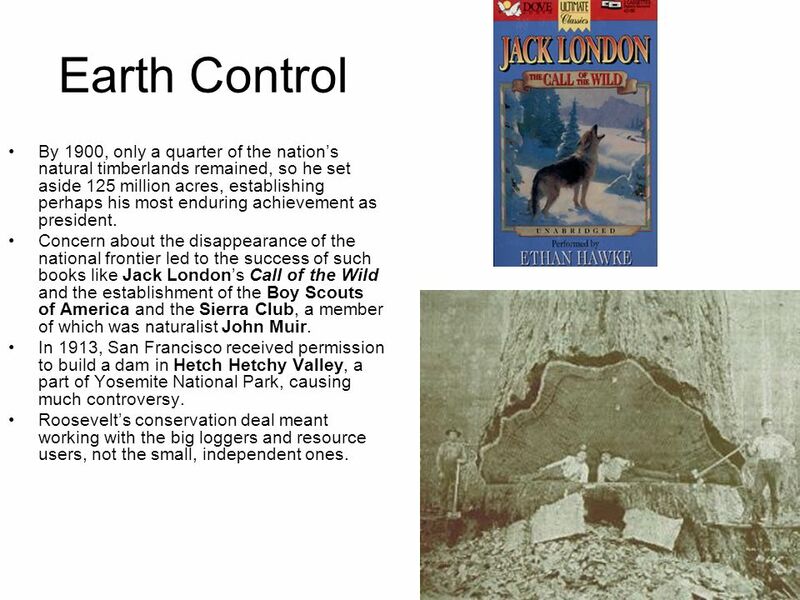 Concern about the disappearance of the national frontier led to the success of such books like Jack London’s Call of the Wild and the establishment of the Boy Scouts of America and the Sierra Club, a member of which was naturalist John Muir. In 1913, San Francisco received permission to build a dam in Hetch Hetchy Valley, a part of Yosemite National Park, causing much controversy. Roosevelt’s conservation deal meant working with the big loggers and resource users, not the small, independent ones. In 1904, TR announced that he would not seek the presidency in 1908, since he would have, in effect, served two terms by then. 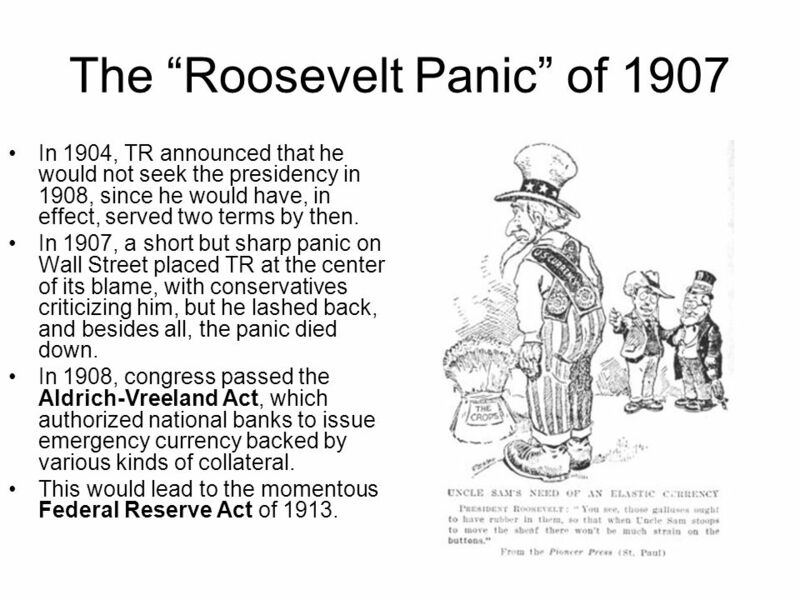 In 1907, a short but sharp panic on Wall Street placed TR at the center of its blame, with conservatives criticizing him, but he lashed back, and besides all, the panic died down. In 1908, congress passed the Aldrich-Vreeland Act, which authorized national banks to issue emergency currency backed by various kinds of collateral. This would lead to the momentous Federal Reserve Act of 1913. TR left the presidency to go on a lion hunt, survived, and returned, still with much energy. He had established many precedents and had helped ensure that the new trusts would fit capitalism and have healthy adult lives helping the American people. 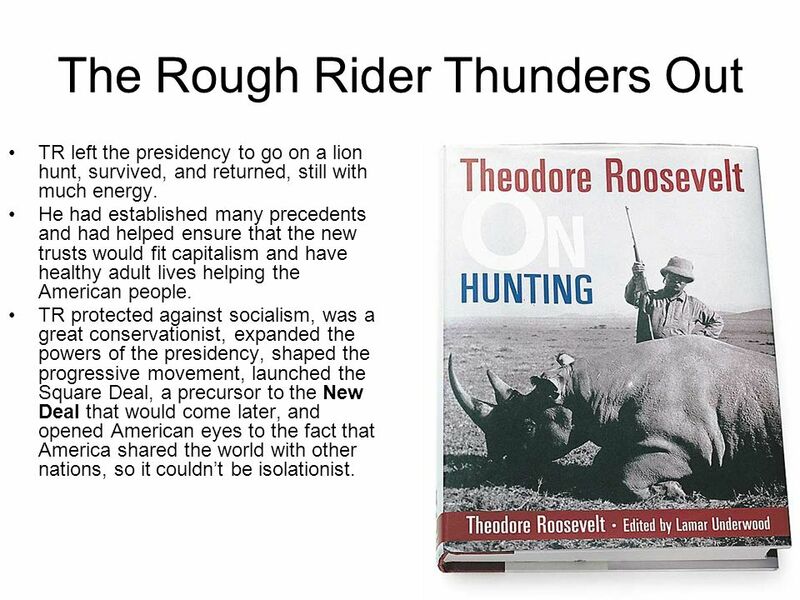 TR protected against socialism, was a great conservationist, expanded the powers of the presidency, shaped the progressive movement, launched the Square Deal, a precursor to the New Deal that would come later, and opened American eyes to the fact that America shared the world with other nations, so it couldn’t be isolationist. William Taft was a mild progressive, quite jovial, quite fat, and passive, but he was also sensitive to criticism and not as liberal as Roosevelt. Taft urged Americans to invest abroad, in a policy called “Dollar Diplomacy,” which called for Wall Street bankers to sluice their surplus dollars into foreign areas of strategic concern to the U.S., especially in the Far East and in the regions critical to the security of the Panama Canal, or otherwise, rival powers like Germany might weaken U.S. trade. 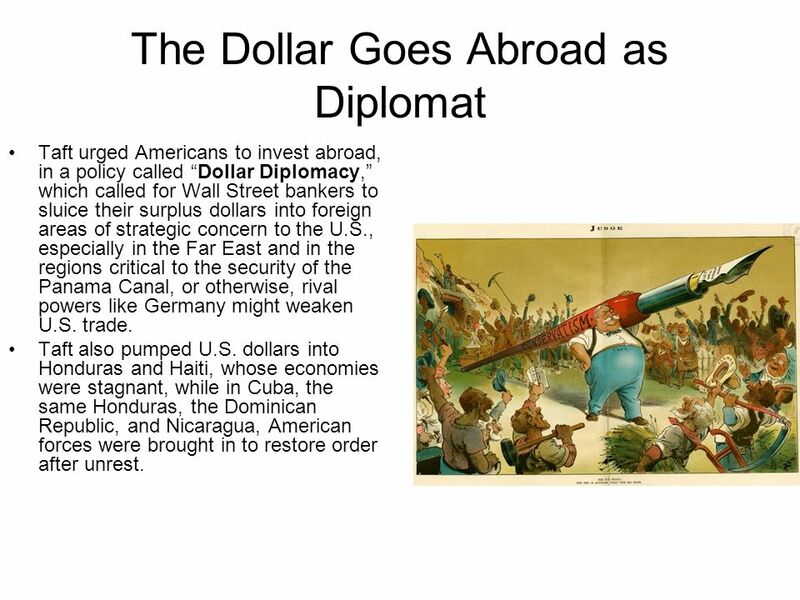 Taft also pumped U.S. dollars into Honduras and Haiti, whose economies were stagnant, while in Cuba, the same Honduras, the Dominican Republic, and Nicaragua, American forces were brought in to restore order after unrest. 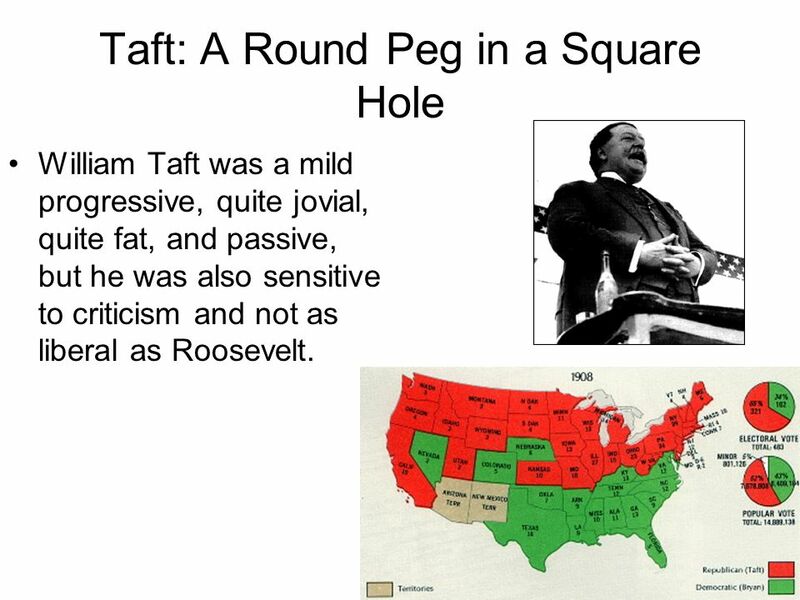 26 Taft the Trustbuster In his four years of office, Taft brought 90 suits against trusts. In 1911, the Supreme Court ordered the dissolution of the Standard Oil Company. After Taft tried to break apart U.S. Steel, he increasingly became TR’s antagonist. 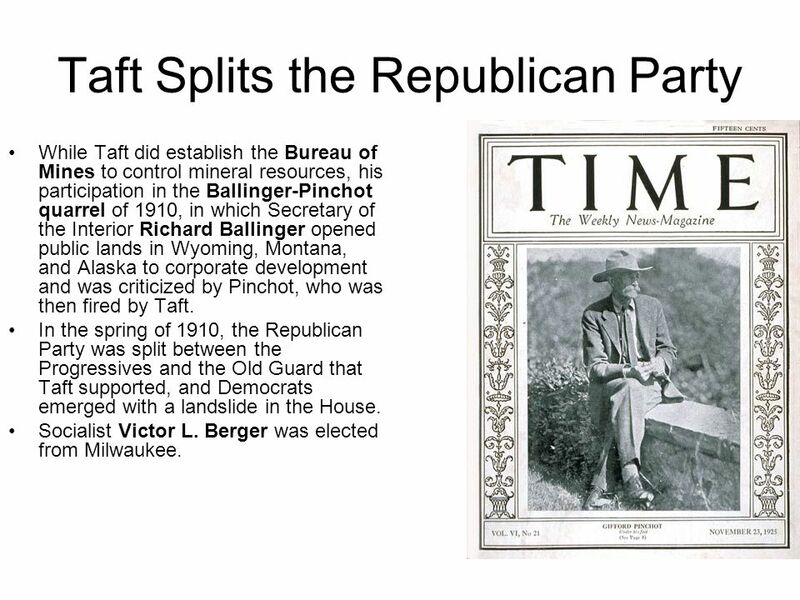 While Taft did establish the Bureau of Mines to control mineral resources, his participation in the Ballinger-Pinchot quarrel of 1910, in which Secretary of the Interior Richard Ballinger opened public lands in Wyoming, Montana, and Alaska to corporate development and was criticized by Pinchot, who was then fired by Taft. In the spring of 1910, the Republican Party was split between the Progressives and the Old Guard that Taft supported, and Democrats emerged with a landslide in the House. Socialist Victor L. Berger was elected from Milwaukee. In 1911, the National Progressive Republican League was formed, with La Follette as its leader, but in February 1912, TR began dropping hints that he wouldn’t mind being nominated by the Republicans, his reason being that he had meant no third consecutive term, not third term overall. 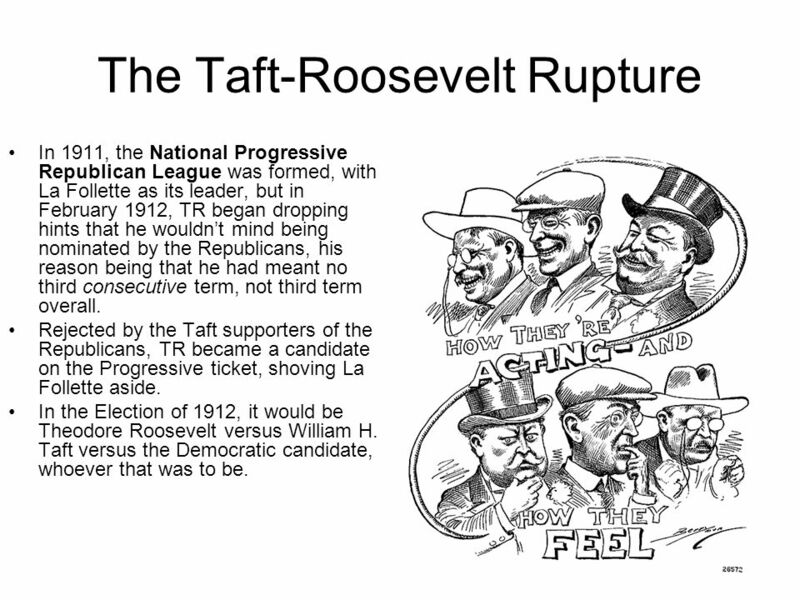 Rejected by the Taft supporters of the Republicans, TR became a candidate on the Progressive ticket, shoving La Follette aside. In the Election of 1912, it would be Theodore Roosevelt versus William H. Taft versus the Democratic candidate, whoever that was to be. 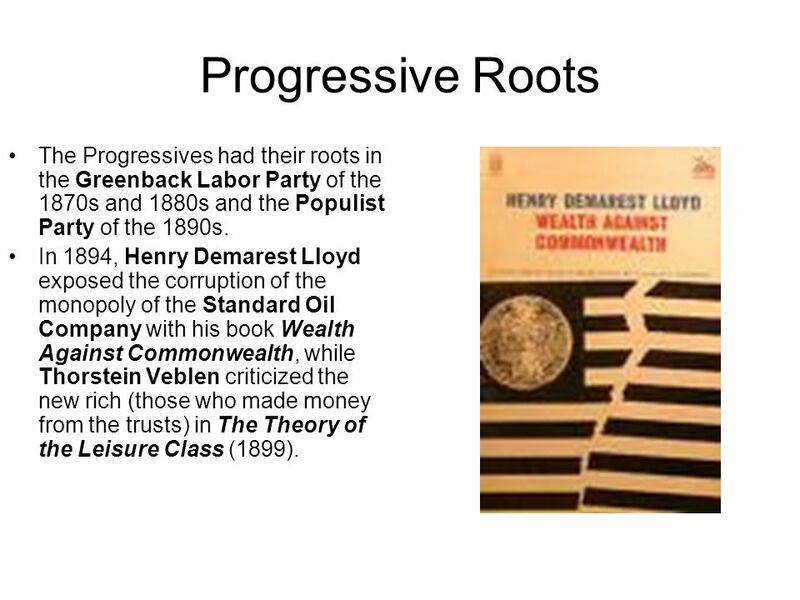 Download ppt "Progressive Roots The purpose of the Progressive Movement was to use the government as an agency of human welfare. America had 76 million people in the." Question? What were the four areas progressives wanted reformed? How were they addressed? Do Now What are some laws that you would like to reform? 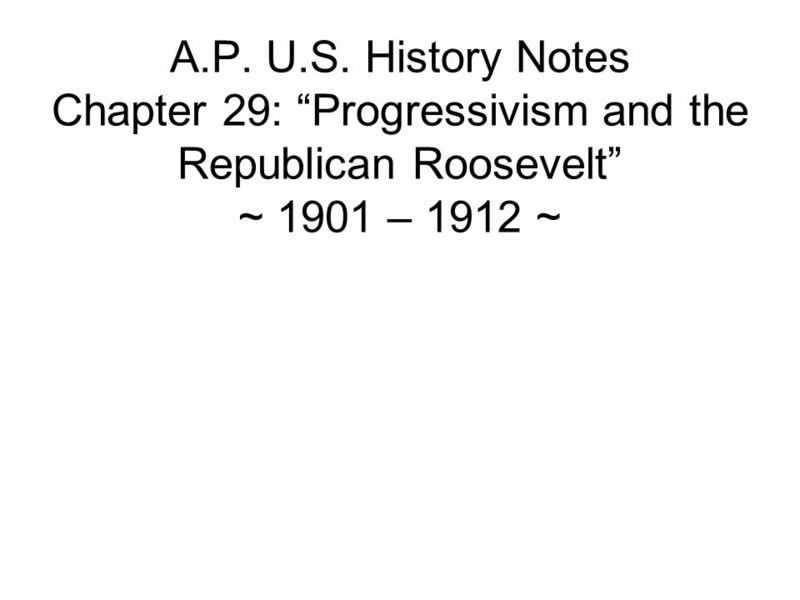 CHAPTER 28 PROGRESSIVISM AND THE REPUBLICAN ROOSEVELT. The Progressive Presidents Mr. Johnson Hopewell High School. The Progressive Presidents In 1901, Republican President William McKinley was assassinated... …Vice President Theodore Roosevelt became president. Brought to You By: Zach “the Big Handsome” Werlinger Cody “the Dirt Farmer” Conrad CQ7o. What kind of negative impact did Industrialization have on workers, farmers, cities, women, children, etc? The Progressive Movement Review. Which amendment made it legal for the federal government to tax the incomes of individuals directly? 1901 –  The Gilded Age:  “predatory wealth” & “conspicuous consumption”  The Greenback Labor Party & Populist Party  1870s and 90s  Responding. What were the goals of the Progressives and what were their accomplishments?